Summer is finally here, officially, and smoothies and smoothie bowls are in full swing! We have some classic favs and many days we play with ingredients and just make something fun based on our mood. 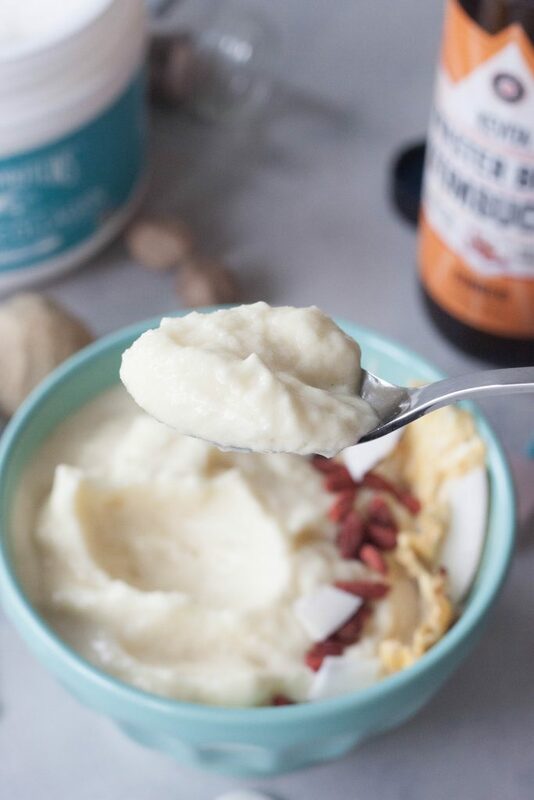 There are a couple new, not so new, ones I’m loving lately and this Ginger Kombucha Pineapple Smoothie Bowl is one of them! Along with a coffee one that I’ve been making almost daily and posting on Instagram Stories and switching up based on my mood and needs but keeping it basically the same. Kombucha smoothies and smoothie bowls have been in regular rotation around our house for some time now. I love not only the nutritional benefits but the refreshing texture and taste for the warmer days. I think of it like comparing our regular dairy free milk based smoothies to this as comparing ice cream to sorbet. 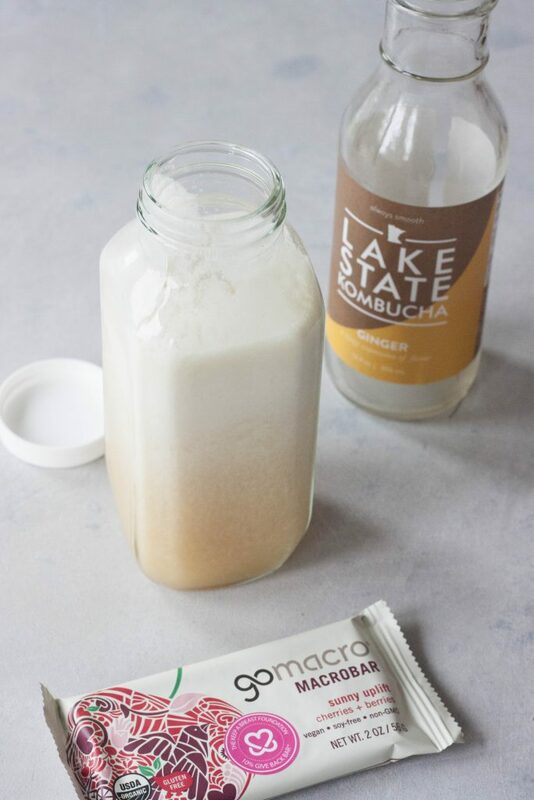 This is kind of like a healthy take on a dole whip as the base is pineapple, the kombucha adds a little fizz, and I love adding in a little extra ginger and a pinch of nutmeg. I will tell you just a pinch of nutmeg makes a big difference in this one. Not a real comparison but if you’ve ever had real fettuccine, as in heavy cream, butter, and Parmesan cheese if you add a little fresh ground nutmeg it is life changing. I just can’t explain it but once you add it life will never be the same and you will never make it without it again. Or think of it like a recipe your grandma makes and adds a pinch of cinnamon or spice and you leave it out and it just isn’t the same and you know something is missing. 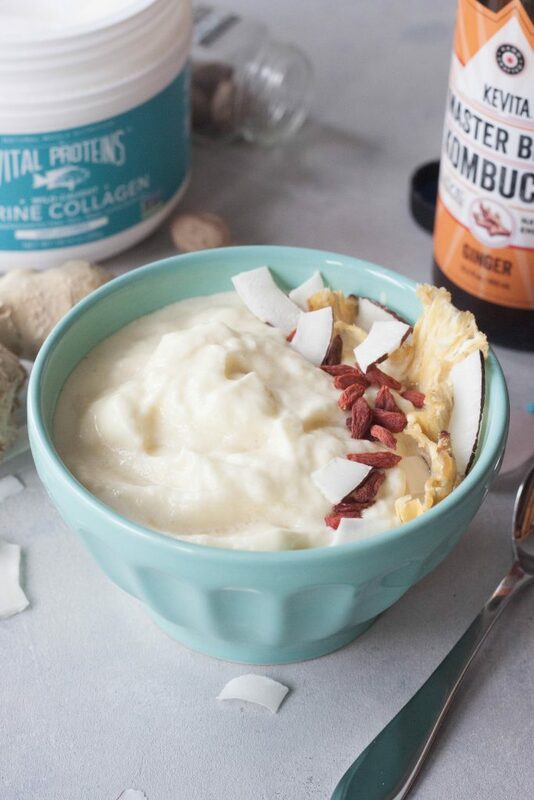 While I don’t like adding my favorite superfoods/adaptagens like maca and ashwagandha to this smoothie bowl because it will alter the taste ,and I don’t like adding protein powder because that also changes the taste and texture, I do add collagen sometimes. Adding the collagen doesn’t change the taste or texture and adds in a little protein and collagen for my aging hair, skin, nails, and joints. I also like to keep the toppings minimal and simple and this is pretty much as crazy as I go with dried pineapple, goji berries, and shredded coconut. Often I will just enjoy it plain or maybe with a few raspberries. On the go I also add more kombucha or less pineapple to make a refreshing frosty drink. It’s so good and great to take to sip on the sidelines at soccer and pairs great with a Sunny Uplift Go Macro Bar. One of those simple combos that can’t be beat, especially on a really hot summer day! Refreshing Ginger Kombucha Pineapple Smoothie great for on the go! 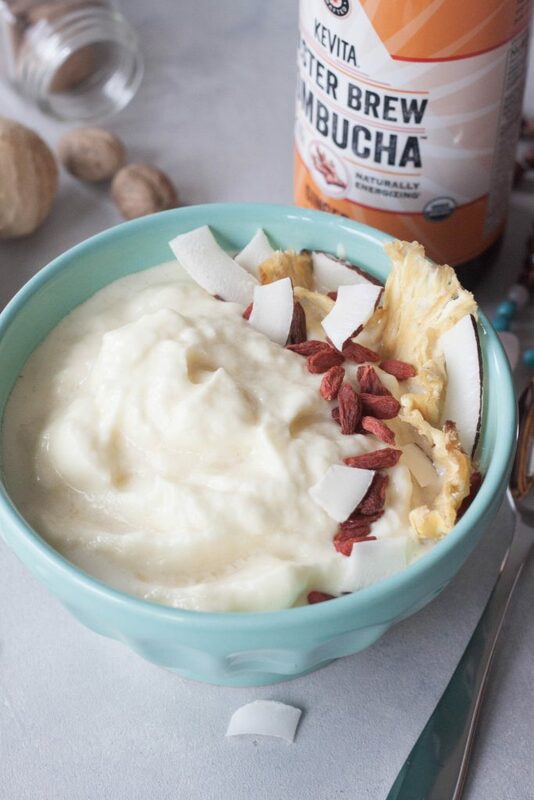 Refreshing, simple, and smooth pineapple and kombucha smoothie bowl that just tastes like a dreamy dessert! 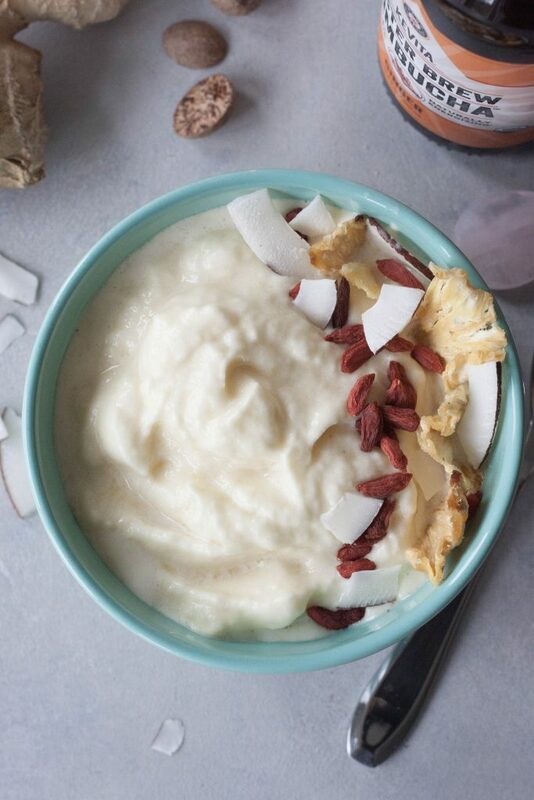 This healthy smoothie bowl is gluten free and vegan (without optional add-ins) and can also be made into a refreshing smoothie. In a Vitamix, or high-speed blender, blend together kombucha and 1 cup of frozen pineapple. If adding collagen add it now before it gets too thick. Add in more pineapple as needed and use the tamper tool to create a thick creamy texture. Spoon into a bowl and top with optional toppings of choice. Enjoy! To make a drink refreshing drink I will add more kombucha or less pineapple to reach desired consistency and amount. I have yet to try Kombucha. I need to!